可算名詞 【エジプト神話】 フェニックス，不死鳥 《アラビア砂漠に 500 年または 600 年ごとに自ら香木を積み重ねて焼死し，その灰の中から生まれ変わるという霊鳥; 不死の象徴》. [the P ] 【天文】 鳳凰(ほうおう)座. From 古期英語 and Old French fenix, from Medieval Latin phenix, from Latin phoenīx, from Ancient Greek φοῖνιξ (phoînix), from Egyptian bnw (boinu, “grey heron”). The grey heron was venerated at Heliopolis and associated in Egypt with the cyclical renewal of life because the bird rises in flight at dawn and migrates back every year in the flood season to inhabit the Nile waters. 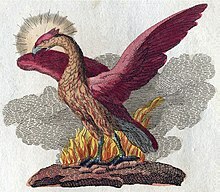 (mythology) A mythological bird, said to be the only one of its kind, which lives for 500 years and then dies by burning to ashes on a pyre of its own making, ignited by the sun. It then arises anew from the ashes. (figuratively) Anything that is reborn after apparently being destroyed. Usually used as a simile. Astronomers believe planets might form in this dead star's disk, like the mythical Phoenix rising up out of the ashes. (Chinese mythology) A mythological Chinese chimerical bird whose physical body symbolizes the six celestial bodies. (historical) A Greek silver coin used briefly from 1828 to 1832, divided into 100 lepta. ^ Maria Carmela Betrò, Hieroglyphics: The Writings of Ancient Egypt (Abbeville, 1996), 108. Third declension, non-i-stem (genitive 複数形 in -um).